With the warmer weather upon us, many of us are getting outdoors to enjoy the sun. Of course, that means stocking up on sunscreen. What kind is best? I recently posted about one chemical sunscreen called oxybenzone, and advised you of the dangers. A close cousin to oxybenzone is “para-aminobenzoic acid (PABA),” another type of sunscreen you’d be best to avoid for the health of your family. 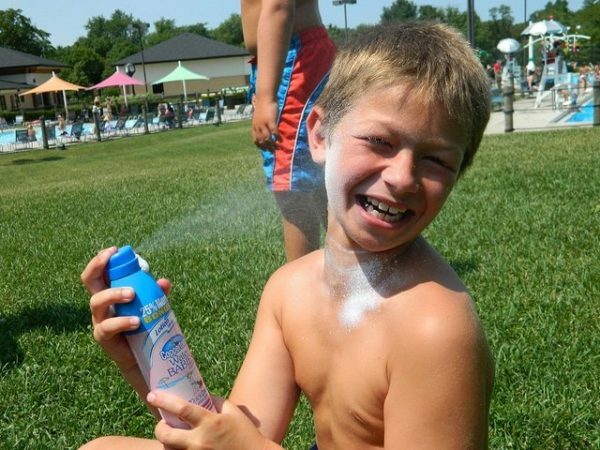 This summer, be cautious in your choice of sunscreens to avoid exposing your family to potentially harmful chemicals. PABA is a natural chemical found in the vitamin folic acid and also in several foods, including grains, eggs, milk, and meat. In medicine, it’s used to treat some skin conditions, as well as in some cases of arthritis, infertility in women, anemia, rheumatic fever, systemic lupus erythematosus, and even headaches. Since it is a natural ingredient with a broad range of uses, one would think PABA would be safe for use as a sunscreen. Unfortunately, some studies have raised concerns that it may not be safe to use topically. PABA was introduced into sunscreens in the 1970s because of its natural ability to absorb UV rays—the ones that cause sunburn. Most sunscreens today, however, don’t use PABA. Like oxybenzone, it was found to increase sensitivity to allergic reactions. Because so many consumers were experiencing allergic reactions to it, it gained a reputation as being a skin sensitizer. It also tended to stain clothing. More concerning, however, were studies that showed PABA may damage DNA. In the later 1990s, University of Oxford researcher Dr. John Knowland reported on studies that showed when DNA was added a chemical sunscreen and exposed to sunlight, the sunscreen broke down, releasing free radicals that could damage the DNA. Results such as these raised the concern that PABA could actually encourage the formation of cancerous cells in the skin. Along with this concern of DNA damage is the fact that the skin can and does absorb PABA, with the breakdown ingredients detected in urine samples. So far we have no evidence that such absorption is damaging, however. The good news is that most manufacturers have phased out the use of PABA because of its tendency to cause allergic reactions. Still, it’s best to read labels, and choose zinc oxide or titanium dioxide, which according to the research we have today, are the safest options. The healthiest move, however, may be to stay out of the sun during peak times between 10:00 a.m. and 3:00 p.m., and to make good use of hats and light clothing to protect your skin. Do you have a favorite sunscreen that you feel is safe? Please share your tips. Photo courtesy MissFrankie828 via Flickr.com. PABA, Environmental Working Group’s Skin Deep Database, http://www.ewg.org/skindeep/ingredient/704390/PABA/#. Shaw AA, et al., “Photoaddition of p-aminobenzoic acid to thymine and thymidine,” Photochem Photobiol, 1992 May;55(5):657-63. http://www.ncbi.nlm.nih.gov/pubmed/1528978.